The Twenty-fifth United States Infantry Regiment was one of the racially segregated units of the United States Army known as Buffalo Soldiers. The 25th served from 1866 to 1957, seeing action in the American Indian Wars, Spanish–American War, Philippine–American War and World War II. 1 Other units known as "25th Infantry Regiment"
Other units known as "25th Infantry Regiment"
There was a 25th Infantry Regiment, raised in 1812, that served on the Lake Champlain front and the Niagara Frontier in the War of 1812. In 1815, during a postwar reduction in force, it was consolidated with four other regiments to form the 6th Infantry Regiment. Beginning in January 1864, the 25th United States Colored Infantry was recruited and trained at Camp William Penn near Philadelphia, Pennsylvania. This regiment mustered out of service on December 6, 1865. On 28 July 1866 the 2nd Battalion, 18th Infantry, raised in 1861 for service in the American Civil War, was separated and designated the 25th Infantry Regiment. In 1869, it was consolidated back into the 18th. Soldiers of the 25th Infantry, Fort Keogh, Montana, 1890. After the Civil War, the regular army was expanded to 45 infantry regiments from its wartime strength of 19. The act of Congress that authorized this included the creation of four regiments of "Colored Troops", racially segregated units with white officers and African-American enlisted men. The army had raised a number of volunteer United States Colored Troops (USCT) regiments during the war. The new regiments were the 38th, 39th, 40th and 41st Infantry Regiments, and they set about recruiting mostly from USCT veterans. By an act of 3 March 1869, Congress reduced the 45 regiments to 25, and the four colored regiments to two. The 39th and 40th Regiments were consolidated and renumbered as the 25th Infantry Regiment. In April the 25th established its first headquarters at Jackson Barracks, Louisiana, under command of Colonel Joseph A. Mower. In May 1870 the regiment was ordered to San Antonio, Texas. After a short period there, its companies were distributed across a number of small west Texas posts, including Forts Bliss, Clark, Davis, and Stockton. The 25th was posted along the Mexican border in Texas and New Mexico for the next ten years, providing border security, building roads and telegraph lines, and on occasion participating in operations against Indian bands. In 1878, a detachment entered Mexico on a punitive expedition. In 1880 the 25th was transferred to the northern Great Plains, operating mostly in Dakota Territory, Montana and Minnesota. Elements of the 25th took part in the last major Indian campaign, the Pine Ridge Campaign of 1890–91. Several companies of the 25th were deployed to break the Northern Pacific Railroad strike of 1894. In 1896 Lieutenant James A. Moss formed a volunteer corps of bicycle troops to study the effectiveness of the concept, especially in the mountainous terrain of the Rockies. Eight soldiers and Moss made practice runs to Glacier and the Yellowstone National Park in the summer of 1896. In 1897, Moss, a surgeon, a reporter and 20 enlisted men made a 41-day, 1,900-mile ride from Fort Missoula, Montana to St. Louis, Missouri. All four colored regiments were transferred to Florida in the spring of 1898 in preparation for the war with Spain. They were assigned to Major General William R. Shafter's V Corps, which moved to Cuba to capture the major eastern city, Santiago de Cuba. The 25th participated in the 1 July 1898 assault on El Caney, commanded by Brigadier General Henry W. Lawton. Men from the 25th were among the first to reach the summit. Private T.C. Butler of H Company was first into the blockhouse at the summit, capturing the Spanish flag. 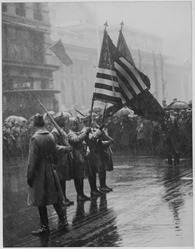 An officer of the 12th Infantry ordered Butler to turn over the flag, and the 12th later claimed credit for the capture. Lieutenant Colonel A. S. Daggett, commanding the 25th, filed an official protest over the incident. On 14 July, when the Spanish surrendered the city, the 25th had advanced closer to Santiago than any other unit. In 1899 the 25th returned from Cuba to posts in the southern Rockies. Late in the year they shipped out to the Philippine Islands to participate in operations against the Philippine nationalist movement of Emilio Aguinaldo. They returned to the U.S. in 1902. In 1906 a company of the 25th Infantry was dishonorably discharged without a trial on grounds of having shot at whites in Brownsville, Texas. In 1972 the accused were found to be innocent of the charges and the 1906 order was reversed. In the summer of 1910, the newly created United States Forest Service was fighting hundreds of fires across northern Idaho, Western Montana and eastern Washington. Drought conditions, high winds, high temperatures and lightning had created hundreds of forest fires. Dispatched by the Army to assist in the firefighting efforts, members of Company G, 25th Infantry Regiment, stationed at Fort George Wright in Spokane, Washington were sent to Avery, Idaho. Arriving on 17 August 1910, the soldiers worked on the fire threatening the town over the next four days. On 21 August the forest fire, pushed by strong winds and joining other fires, forced the evacuation of Avery, and the Soldiers of the 25th Infantry Regiment were instrumental in the safe evacuation of hundreds of townsfolk. By the time the fire ended a few days later, over three million acres had been burned. After the fire the soldiers assisted with the cleanup and in the search and recovery of the many that were killed during the fire. In the PBS documentary titled "The Big Burn", historians credit the Buffalo Soldiers with saving the town of Avery by building a "back" fire that collided and then consumed the "front" fire until there was no fire. Their "wit" saved the town from utter destruction. During World War I, the 25th was assigned to garrison duty at Schofield Barracks in Hawaii and did not see combat. In World War II the 25th Infantry Regiment (Colored) was an organic element of the 93rd Infantry Division (Colored) and served in the Pacific Theater of Operations. The regiment departed San Francisco on 24 January 1944 and arrived on Guadalcanal in echelons between 7 February and 5 March 1944. From there the regiment was transferred to Bougainville and attached to the Americal Division to take part in offensive operations against Japanese forces on that island in April and May of the same year. From 26 May to 21 June the regiment was stationed on the Green Islands where it received further training and was employed for the construction of defensive fortifications and installations. From 10 November 1944 to 30 March 1945 the 25th Infantry Regiment was involved as defence regiment around Finschafen New Guinea. The regiment's final transfer during World War II was to Morotai Island where it arrived by 12 April 1945 where it once again participated in offensive operations until the end of the war. For World War II the 25th Infantry Regiment (Colored) received campaign credit for the Northern Solomons, Bismarck Archipelago and New Guinea. The regiment was inactivated at Camp Stoneman, California on 3 February 1946, and relieved from assignment to the 93d Infantry Division on 5 February 1946. Within a few years, the entire U.S. military was ordered desegregated by President Harry Truman, ending all segregation in the American armed forces. Right after the 25th Infantry Regiment was inactivated in February 1946 at Camp Stoneman, California, it was brought back to life during the period February-May 1946 at Fort Benning, Georgia. But first, the 107th Regimental Combat Team (RCT) (Colored) is worth mentioning and is part of this story. First Army activated the 107th RCT at Fort Benning, Georgia on 21 February 1946. It was activated with all the required supporting forces as the 107th Infantry Regiment; the 571st Field Artillery Battalion (105mm Howitzer, Truck Drawn); 22d Medium Tank Company; 973d Engineer Combat Company; and the 375th Medical Collecting Company. The 107th had recently been assigned the 196th Army Ground Forces Band (Colored) from Camp Shelby, Mississippi. The 107th RCT had an assigned strength of 139 officers, 7 warrant officers, and 2,662 enlisted men. Officer personnel was white and colored while enlisted personnel was all colored. The 107th RCT history would be short-lived. On March 21, 1946, the 107th would be reflagged as the 25th Regimental Combat Team (Colored) assigned to Fourth Headquarters, First Army and would inherit all the units of the 107th RCT minus the 107th Infantry Regiment. The first commander of the 25th RCT was Colonel (later BG) Robert L. Dulaney a veteran of WWII in Europe. On April 6th, the regiment was selected to march in the Army Day parade down Constitution Avenue in Washington, D.C. representing all veterans from WWI and WWII. On April 18, 1946, the entire 25th RCT moved to the Sand Hill area of Fort Benning. In May 1946, the 25th RCT activated its 3d Battalion which had been unfilled since March 21, 1946. With the new 3d battalion now part of the 25th RCT, personnel would increase by 139 officers, 5 warrant officers, and 2810 enlisted personnel for a 25th RCT total of approximately 4,000 soldiers. In early November 1946, the 25th RCT regimental colors were returned to the unit in a ceremony at the 25th RCT parade grounds at the Sand Hill area. Also in November 1946, the 25th RCT established a new two-year educational program geared towards enlisted soldiers lacking education below the 8th grade. As part of their training, the program was designed to raise to an 8th grade level those students that fell into the educational sub-par brackets of IV and V on the Army General Classification Test. Some 1,900 25th RCT students began the program in early November 1946 at Fort Benning, Georgia. Now that the 25th RCT had been brought up to full personnel strength, it would soon be supporting its old friend the 24th Infantry Regiment (Colored). The 24th was now on occupation duty in the Far East. The Army was going to try an experiment of integrating the entire 24th Infantry Regiment (Colored) into the white 25th Infantry Division also on occupation duty in Japan. This would leave the 27th and 35th Infantry Regiments in the division. The 4th Infantry Regiment was pulled out of the division and returned to the states. To bring the 24th Infantry Regiment up to full strength, the War Department approved transferring soldiers from the 25th Infantry Regiment to the 24th Infantry Regiment on very short notice. Over 20 officers and 515 soldiers from the 25th Infantry Regiment at Fort Benning were intensively trained for this assignment. This contingent of soldiers left Fort Benning, Georgia, on 5 February 1947, under the command of Capt. Raymond A. Diggs on their first leg of a long-distance journey by ship to Japan. These soldiers arrived in Japan in late February 1947. In a ceremony at the Sand Hill parade grounds early in March 1947, the 25th Infantry Regiment received its three WWII Asiatic-Pacific campaign streamers for New Guinea, Northern Solomons, and Bismarck Archipelago. In a major reorganization of the 25th RCT, the regimental combat team organization was no more on February 15, 1947. The 25th Infantry Regiment organization would remain along with the same supporting units with the addition of the 999th Field Artillery Battalion. The number of 25th Infantry rifle battalions would drop from three to two. The First Battalion was designated to furnish personnel for the Air Indoctrination Course that was to be conducted at Lawson Field, Fort Benning. The Second Battalion was attached to the 325th Airborne Infantry Regiment and acting as demonstration troops for the Infantry School at Fort Benning and working problems for students.The 25th would celebrate its 78th Anniversary the week of May 4, 1947, during "Organization Day" at Fort Benning. It had been organized on April 20, 1869, by an Act of Congress. The 25th Infantry Regiment had fought in four wars in its 78-year history. The regiment had participated in the Indian Wars, the War with Spain, the Philippine Insurrection, and World War II. In July 1947, the 25th Infantry Regiment would lose one of its units, the 571st Field Artillery Battalion. It was being transferred to Fort Riley, Kansas, to the Army’s Field Artillery Center where it would serve as a “School Troops” unit for Artillery Officer Candidate classes at Riley. The 571st performed similar functions while assigned to Fort Benning. Prince Romerson (c. 1840–1872), a Native Hawaiian soldier from the Kingdom of Hawaii who also fought in the Civil War. Carroll Augustine Devol (1859–1930), quartermaster. Gilbert W. Lindsay (1900–1990), Los Angeles City Council member, 1963–1990. ^ "Unit Lineage and Honors Information, section "6th Infantry"". United States Army Center of Military History. ^ ""Unit Lineage and Honors Information", section "18th Infantry"". United States Army Center of Military History. Hosler, Lieutenant Colonel Roderick A. (2 January 2011). "Hell on Two Wheels: The 25th Infantry Bicycle Corps". armyhistoryjournal.com. The Army Historical Foundation. Retrieved 21 September 2014. ^ a b Schubert, "Buffalo Soldiers at San Juan Hill"
^ Egan, Timothy (2009). The big burn:Teddy Roosevelt and the fire that saved America. New York: Houghton Mifflin Harcourt. ^ Lewis, Edson E. (7 September 1910), Report of the Commanding Officer of G Company, 25th Infantry Regiment in Fletcher, Marvin (Summer 1972). "Army Fire Fighters" (PDF). Idaho Yesterdays: 12–15. Archived from the original (PDF) on 20 July 2014. Retrieved 16 July 2014. ^ McNeil, William (2007). Black Baseball Out of Season. Jefferson, N.C.: McFarland. p. 52. ^ McCunn, Ruthanne Lum (2015). "Prince Romerson". In Shively, Carol A. (ed.). Asians and Pacific Islanders and the Civil War. Washington, D. C.: National Park Service. pp. 142–145. ISBN 978-1-59091-167-9. OCLC 904731668. ^ "Major General Devol Ends Life With Gun. Retired Army Officer Had Been Ill for Several Months in California Home". The New York Times. 4 June 1930. Retrieved 11 April 2015. ^ Template:James L. Crowder, Jr., "Osage Aviator: The Life and Career of Major General Clarence L. Tinker," The Chronicles of Oklahoma 65 (Winter 1987-88). Coffman, Edward M. (1988). The Old Army:A Portrait of the American Army in Peactime, 1784–1898. Oxford University Press, New York. ISBN 0-19-504555-6. Nankivell, John H. Buffalo Soldier Regiment: History of the Twenty-Fifth United States Infantry. ISBN 0-8032-8379-2. Pullen, Frank W., Jr. (23 March 1899). ""A Perfect Hailstorm of Bullets": A Black Sergeant Remembers the Battle of San Juan Hill in 1899". History Matters: The U.S. Survey Course on the Web. Retrieved 29 October 2008. Schubert, Frank N. (1998). "Buffalo Soldiers at San Juan Hill". United States Army Center of Military History. Archived from the original on 23 October 2008. Retrieved 28 October 2008. Egan, Timothy, (2009). – The Big Burn: Teddy Roosevelt and the Fire That Saved America – Houghton Mifflin Harcourt – ISBN 0-618-96841-5. Stanton, Shelby S. (1991). World War II Order of Battle. Galahad Books, New York. ISBN 0-88365-775-9. "Unit Lineage and Honors Information". United States Army Center of Military History. Archived from the original on 8 December 2008. Retrieved 28 October 2008. "25th U.S. INFANTRY AT FORT DAVIS, TEXAS". Fort Davis National Historic Site, Fort Davis, Texas. Retrieved 29 October 2008.